The Petite Fleur models are the smallest dynamic temperature control systems in the Unistat range. As with all Unistats, the Petite Fleur models have unique thermodynamic properties for the highest temperature control speed and precision. All models are also space saving, simple to operate, and can be used for a wide number of applications. 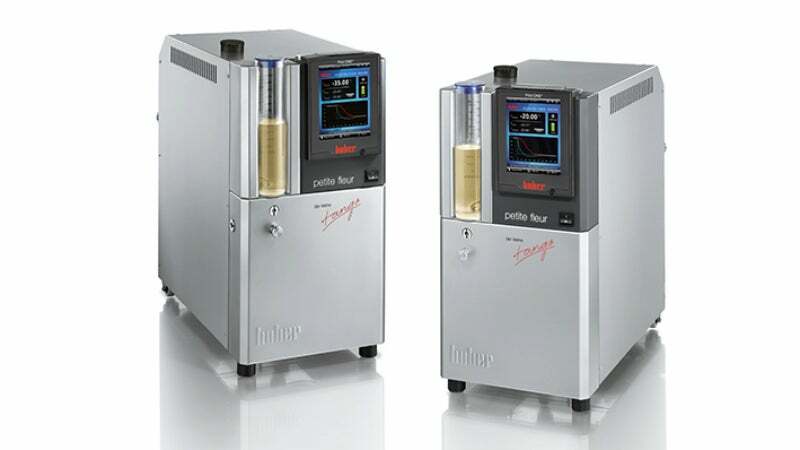 With a 480W cooling capacity available at the full pump speed (according to DIN 12876), a further 50W is available if the pump speed is reduced. The circulation pump, with its high-capacity, ensures optimal delivery and delicate glass reactors are protected from damage with the soft start-up which detects and balances out changes in the viscosity within the fluid circuit. Additional equipment includes the Pilot ONE controller Professional, with a thin-film transistor (TFT) colour display, which can be removed and used as a remote control. It features a programmer, calendar/clock function, user menus, graphic representation, ramp function, calibration, and many additional functions. Almost all models use environmentally friendly natural refrigerants.